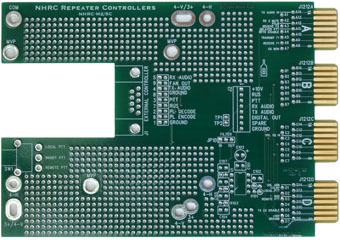 The NHRC-M2/SC is a board that plugs in inside the GE MASTR II station, allowing repeater controllers to be easily interfaced without soldering wires all over the back plane. 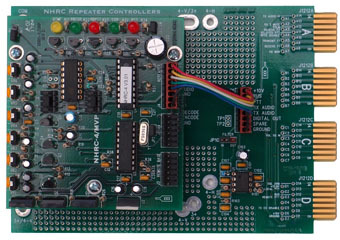 The NHRC-M2/SC can support an internal repeater controller, right in the card cage, or an external controller, interfaced through a common DB9 connector. Plugs in inside a General Electric MASTR II station with no additional wiring. Footprints for NHRC-3+, NHRC-4, and NHRC-4/MVP controllers on board. Easily configured for NHRC-5, NHRC-6, NHRC-7, or NHRC-10. Jumpers permit alternative wiring scheme of DB9 connector. Large prototype area allows custom interface circuitry to be built on this board. All important backplane signals are labelled. Allows simple connection to station, no soldering wires to backplane. The high pass filter components are NOT included. This board ships unassembled so users may configure it for any purpose. The NHRC-M2/SC plugs into slot J1212 in the MASTR II Station, the 2nd slot from the left. All signals needed to interface a repeater are available on the card. 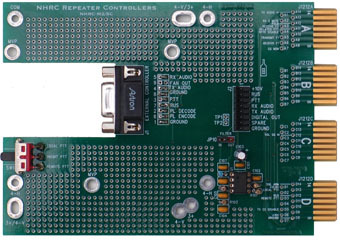 Depending on user selection, the card can be set up for a internal NHRC controller, external NHRC controller, or any other controller that can be attached to the DB9 female connector on the card. The PTT control switch allows the user to select "local" or "remote" PTT, or disable PTT, based on requirements. User-installed straps allow the electrical configuration of the 10 pin molex connector or DB9. In most cases, a repeater station will require no modification at all. Base stations may require that straps on the 10 volt regulator card be moved. Copyright © 2009-2013, NHRC LLC, all rights reserved.